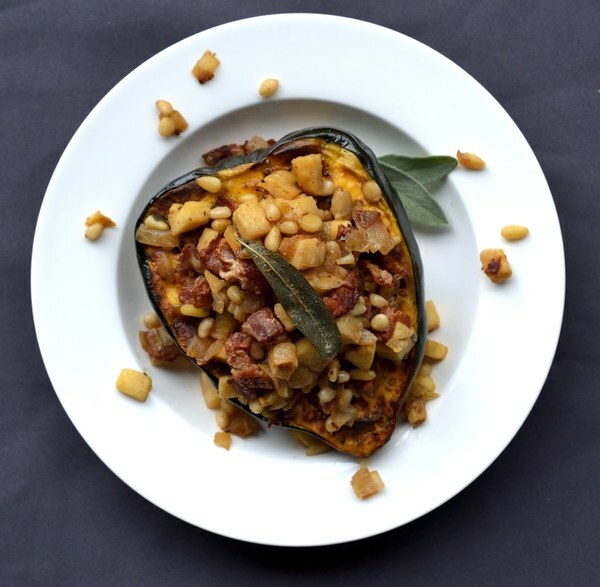 ← Stuffed Acorn Squash with Apple & Bacon. Preheat the oven to 450°F and place the rack in the center position. Cut squash in half lengthwise. Scoop out seeds; discard. Slice a small piece off the bottom of each squash half just enough so that they will sit level. Drizzle cut-side with olive oil and season with salt and pepper. Flip squash halves, scooped sides down, in cast iron skillet. Bake until golden and fork tender, 30-35 minutes. Meanwhile, heat a nonstick skillet to medium-high heat. Chop bacon into ¼ inch pieces and cook until almost crispy. Drain most of the fat. Peel and dice onion. Add to pan, stirring to combine. Sprinkle with thyme and sage. Cook together until onion is soft and caramelized. Core, peel, and medium dice the apples. Add to pan, drizzle with maple syrup and a tsp of salt. Cook 2-3 minutes until apple just starts to soften. Add pine nuts and cook for 1 minute. Remove the squash from the oven. Stuff each half with bacon mixture. To serve, divide squash halves between plates. Enjoy!